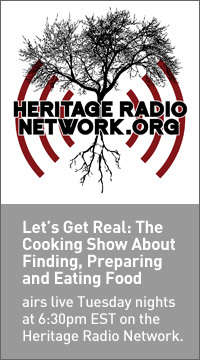 Let’s Get Real was co-created and is co-produced by Chef Erica Wides and Christopher Nutter. The show launched in September, 2011. Soy burgers. Power bars. Protein brownies. Bottled water that makes you thin, young and smart. And we used to wonder what they put in Pop Rocks to make them explode in your mouth. Back in the day you knew the difference between junk food (candy) and food (vegetables); between food that we knew what it was (apples) and food that we didn’t want to know (Twinkies). These days it’s hard for even die-hard foodies to know what they’re eating or drinking. That’s because food has changed from something that didn’t need a modifier – if it walked, swam, flew or grew out of the ground, it was food – to something that stopped off at Mr. Burns’ nuclear plant on the way to your stomach. Today even “whole-foods” are not as whole as they appear: you can be sure that those are not your grandmother’s genetically modified green beans. From green tea soft drinks sweetened with corn syrup and corn-fed farm-raised salmon that’s actually bad for you to taco beef that is only 1/3rd meat and coffee creamer made with petroleum, most of what we’re being fed today isn’t actually made entirely from food. It’s something else. We all have willingly or unwillingly ingested foodiness™ into our lives. And don’t be fooled: foodiness™ isn’t limited to the chicken nuggets and Pop-Tarts crowd. A “health-halo” of marketing has allowed all kinds of foodiness™ to pass as real food. So whether it’s soy protein bars and veggie puffs or McDonalds and microwave pancakes, the problem is the same: we’re not consuming food as much as we’re consuming an edible manufactured doppelganger designed to look and taste like food, but isn’t actually food. Foodiness™ may not be made of people – Soylent Green anyone? — rather think of it as more like eating carpeting. You know it’s not food so you wouldn’t eat it…no matter how bad you’ve got the munchies. But foodiness™ is packaged and flavored as food, so you do. A walk down any grocery store aisle shows that while foodiness™ has become incredibly convenient, a real food can be hard to find. Food has become inconvenient. While growing vegetables, raising chickens, being a “locavore” and getting a birth certificate for every piece of salmon you eat sounds like a really nice idea – and a wonderful thing to be smug about on your Facebook page – let’s face it: for most of us these solutions aren’t very realistic. That’s where Let’s Get Real comes in. On Let’s Get Real Chef Erica Wides walks you down the aisles of the surreal world of food, serving up a heaping dose of reality by separating the food from the foodiness™ so you can forage, hunt, gather, trap and fish for real food anywhere, even in a foodiness™-filled mega market. Incisive, pragmatic, sarcastic, and an unrepentant know-it-all when it comes to anything food, on Let’s Get Real Chef Erica Wides does the job for you of sifting out everything that’s fake in the world of food – from “foodiness™” marketing and cooking show shams to “health-halo green-washing” and annoying whole-food righteousness – so you never unknowingly chow down on carpeting again.